Nationals only add one player to the roster from the Rule 5 eligibles! 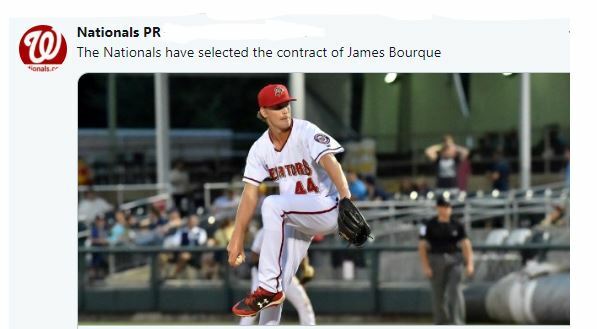 After the build-up to the Rule 5 draft reserve list, the Nationals only protected one player and that was James Bourque who is a hard-throwing right-handed reliever who pitched last year for the High-A PNats and the Double-A Harrisburg Senators. Bourque was excellent for the Senators appearing in 15 games with a 0.92 ERA and a 1.271 WHIP. While Bourque was a virtual lock to be protected, the Nationals will expose 23-players to the Rule 5 draft including Jakson Reetz, Drew Ward (#29 prospect), Aldrem Corredor, Andruw Monasterio, Telmito Agustin (#13 prospect), Taylor Guilbeau, and Andrew Istler. We had thought that Istler would be a candidate for getting protected, but he did not make the cut. Noticeably on that Rule 5 eligible list are several players who should be drafted at the Winter Meetings in the Rule 5 draft and the Nationals list includes former high draft picks, international signings, and two recent acquisitions like Andruw Monasterio who was acquired from the Cubs in the Daniel Murphy trade, and Istler who was the player received in the Ryan Madson trade with the Dodgers. Guilbeau was on the Arizona Fall League roster and gave up the walk-off home run in the championship game on Saturday. Part of the thinking by a GM is that they will gamble and hope that their players are not chosen, but even if they are, it is possible that the player could be returned due to the strict rules that Rule 5 draftees must stay on the Major League roster for the full season by the acquiring team. With Bourque and the acquisition of Kurt Suzuki, the Nationals will move forward with 37 of their 40 roster spots filled right now leaving just 3 coveted spots available for free agents. Rizzo can also open up more roster spots before Opening Day by cutting out-of-option players like Pedro Severino, Matt Reynolds, and Trevor Gott. These players without options either have to make the Opening Day roster or be removed from the roster through a DFA or a trade. There are also players on the 40-man roster who have options like Austin Adams, Adrian Sanchez, and Raudy Read who could also be DFA’d if Rizzo needs spots. As mentioned, Roark, Taylor and Solis are not locks to stay with the Nationals, but they also could negotiate a new deal prior to November 30th. The Nationals had a similar decision with Craig Stammen after the 2015 season because he was returning from flexor tendon surgery, and they could not negotiate a new deal and parted ways. For some players, these are stressful times leading up to each deadline. For other players, Thanksgiving will surely be a time to give thanks. This entry was posted in MikeRizzo, Roster. Bookmark the permalink.